“Survivor’s Remorse” follows Cam Calloway (Jessie T. Usher), a hard-working, young basketball star thrust into the limelight after signing a huge contract with a pro team in Atlanta. 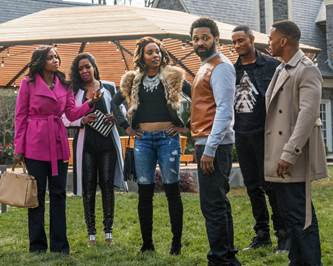 In the second season, we see Cam and his cousin and confidant Reggie Vaughn (RonReaco Lee) continue trying to navigate Cam’s meteoric rise. From business deals to relationships and friendship, the two confront the challenges of balancing the needs of family with the rewards and responsibilities generated by their newfound wealth and fame. Cam, Reggie and the unforgettable group of characters that is the Calloway clan wrestle with the rewards and pitfalls of stardom, love and loyalty.